At approximately 22:10 hrs. on 28th November 1999, a brilliant exploding fireball was observed over Carlow town, Ireland which lasted for several seconds before fading. Shortly afterwards, when the slower travelling sound waves reached the stunned observers, a loud detonation was heard that has been described as "MASSIVE......", "it shook houses......", "security guards feared an explosion.....", "people were too scared to go outside....". A few days later, I received my first news bulletin about the fireball via an online news service and immediately started to find out more information. My first call was to several local newspapers within Carlow town itself and the surrounding area. The Carlow People weekly newspaper was very interested in the story and wanted to run an article about it in the Thursday edition, although at this stage I could do little more than provide information about how to search the area and what kind of rocks people should hunt for.....a reward of up to £20,000.00 British Pounds Sterling also provided a little incentive to the lucky finders! The next edition of the Carlow People featured the story, but no telephone calls, emails or mysterious rocks arrived from the people of Carlow. I was still busy making phone calls and trying to find out about the duration, direction of travel, sonic effects etc., and the newspaper ran a follow-up story again the week after. The trail was beginning to get very cold and it soon became "old news" in the media, with little or no interest in continuing the search. But little did I know that a beautifully fusion crusted individual HAD been recovered by an elderly lady in the nearby town/village of Leighlinbridge on 12th December 1999, but that she had kept the specimen to show her grandson over the Christmas holidays. 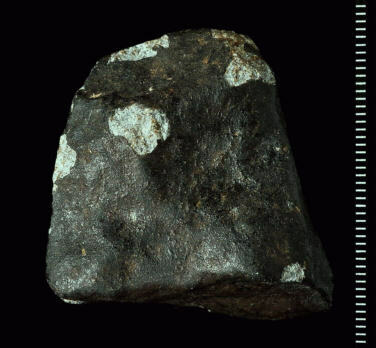 The first that I knew about it was when this "black rock" arrived in my mail on 13th January carefully wrapped up in paper along with several other stones that were dark oxide coated terrestrial rocks. 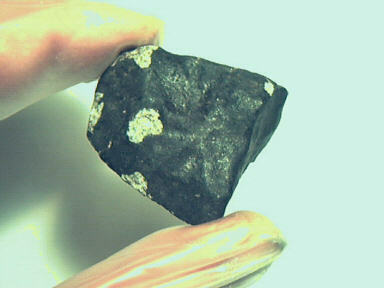 Opening the package to find one of the freshest, blackest meteorites that I've ever seen came as something as a surprise! Elation was quickly followed by disappointment when I realised that there was no sender's address or telephone number, but a telephone call to the Carlow People newspaper quickly located the finder/sender when they printed the story a few days later. Since contacting the finder, I arranged to purchase the stone and any others she had found.........two more fusion crusted individuals have been sent to me, bringing the total to 3 specimens with a total weight of ~220g. 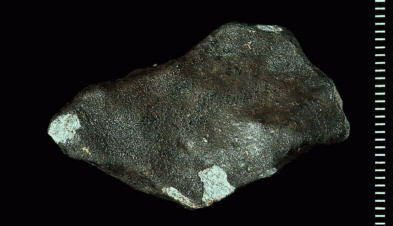 This meteorite has been provisionally named Leighlinbridge (pronounced Lock-lin-bridge). 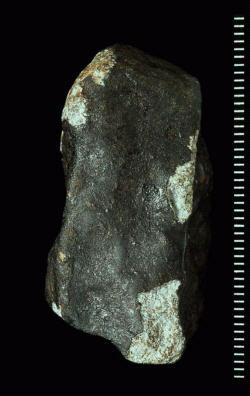 Two weeks after receiving the first sample, I took the specimen to the Natural History Museum in London, and showed it to Dr.Monica Grady and Dr.Sara Russell of the NHM's Mineralogy Department and Arabelle Sexton, researcher and curator of the Open University's meteorite collection in Milton Keynes. An end piece was sliced from the stone revealing a white to grey/white coloured matrix which was later placed under the analytical scanning electron microscope for a quick evaluation of the section. 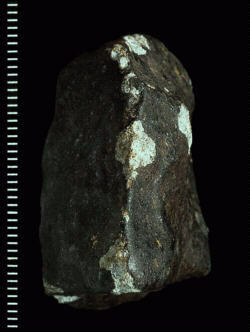 First impressions are that this is an H-group chondrite with heat/pressure altered chondrules of possible type 6, but more analysis will be performed on this stone over the coming weeks. Two of the individuals recovered from this fall show signs of fragmentation in flight, but each is almost perfectly fusion crusted to a high degree (e.g. no signs of the usual thin secondary fusion crusting). 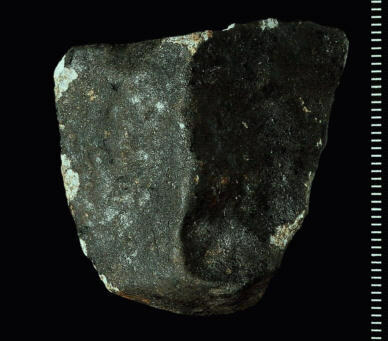 This suggests that the mass exploded at high altitude and that fragments continued to ablate and gain fusion crusting on exposed surfaces, though the surfaces were not melted sufficiently to give a completely smooth finish, leaving a more angular shape to the stones. In a way, this could mean bad news because although a high altitude detonation means some almost perfectly fusion crusted specimens, it could also mean that other meteorites from this fall have been spread far and wide over a large area and prove difficult to recover in this particular locality. Since writing this article for Voyage! magazine sometime in 2000, another individual from this fall was recovered bringing the total known weight up to a "staggering" 271g. We originally guessed that the cut section showing such a high amount of visible metal would safely fall into the H-group, but the results surprised us all.....the analysis has now been completed by Dr.Monica Grady at the NHM and it is now officially an L6 of shock stage S3 and weathering grade W0. The Leighlinbridge name has also been accepted by the Nomenclature Commitee and will be printed in the June 2000 Meteoritical Bulletin. More pictures of Leighlinbridge, courtesy of The Natural History Museum, London. 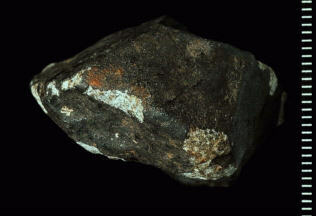 All images are of the first stone recovered, taken from different angles.